Walking down Soho’s Elizabeth Street can feel like a neverending vortex of high-class retail, where the designer clothing racks outnumber the people. That is, until you arrive at the lush, green Elizabeth Street Garden, between Prince and Spring Streets. The green “oasis” (as many have dubbed it) and community hub is once again being actively considered for a site for affordable senior housing, a decision that has long been opposed by Community Board 2 but supported by the area’s City Council member Margaret Chin. Last week, news surfaced that the NYC Housing and Preservation Development (HPD) had officially issued a Request for Proposals to develop the land the garden stands on. 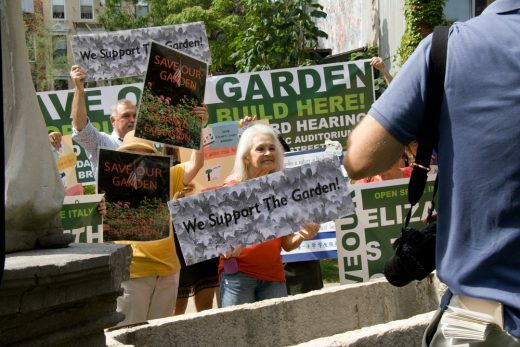 Wednesday afternoon, dozens gathered in the garden for a press conference, bearing signs and passionately asserting their garden’s right to remain where it is.